Medical sources have reported, on Tuesday morning, that dozens of Palestinians suffered the effects of teargas inhalation in Shu’fat refugee camp, and the military roadblock near its main entrances, in occupied Jerusalem. Media sources said the soldiers, stationed at the military roadblock, started stropping and searching dozens of cars and buses, and were deliberately causing delays and traffic jams. Dozens school and college students protested being held at the roadblock, and had to leave the buses and cars, before they started walking to their educational facilities, to avoid further delays. The soldiers then fired many gas bombs and concussion grenades at the students, and dozens of residents and cars near the roadblock, causing scores of Palestinians to suffer the effects of teargas inhalation. 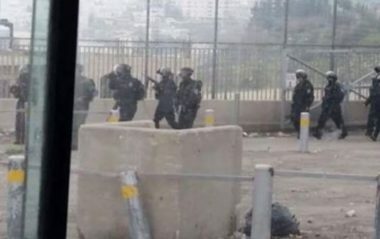 Furthermore, the soldiers abducted, Tuesday, two Palestinians from their homes, in Hebron governorate, in the southern part of the occupied West Bank.